We are a brand new, one-of-a-kind, small scale brewery located in Niagara-on-the-Lake. The location? A former church built around 1894, covered in ivy. The exterior has been left intact while the interior has been recently renovated with a rustic feel of exposed wooden beams and brick walls. Definitely something you have to see for yourself. Many people ask us where we got the name – it’s a reference to Chris Pontsioen’s family history, who were silversmiths for many generations. 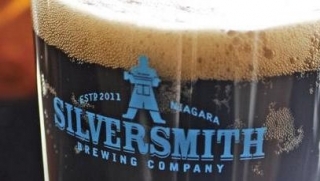 The idea of The Silversmith Brewing Company itself, was conceived in 2011 with a purpose to fulfill a major absence of craft beer in the Niagara community. Since we’ve opened, we have made a lasting impression within the industry and have received ongoing success allowing us to distribute throughout bars, events and restaurants around Ontario! This makes us very happy.